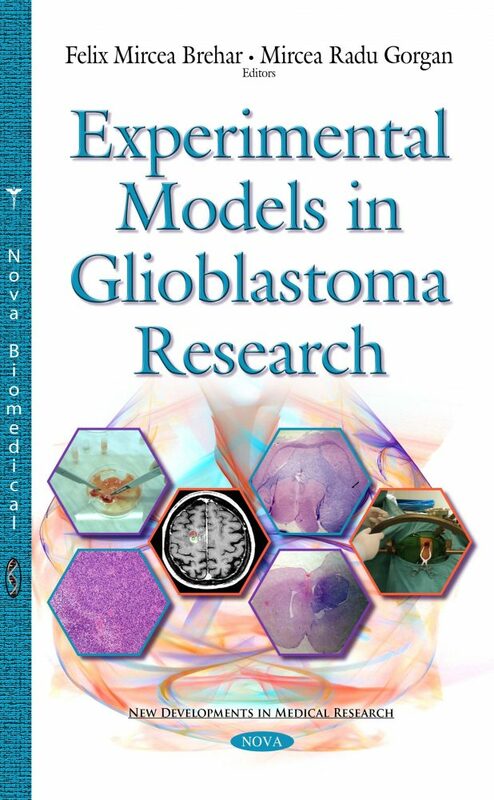 This book covers the basic experimental models in glioblastoma research. It starts with a description in the first two chapters of general clinical, neuroimaging and genetic data about glioblastoma (WHO grade IV glioma), which is the most frequent and the most malignant primary tumor in adults. Despite the complex treatment which includes neurosurgery, radiotherapy and chemotherapy, survival of the patients usually is between 9 and 12 months. Moreover, the surgery is not able to cure the disease due to the specific infiltrative growth pattern of glioblastoma. Therefore, laboratory research is essential in order to find new molecular and cellular therapies for this lethal disease. After shortly reviewing the modern hypothesis regarding the origin of glioblastoma in the third chapter, namely the cancer stem cells hypothesis, the author describes step-by-step in the following chapters (Chapters 4-8) the most important in vitro and in vivo models of research in glioblastoma. Chapter 4 is dedicated to the first and the essential step in any research project on glioblastoma: how to obtain good quality glioblastoma samples, how to prepare the samples and how to store the samples long-term for subsequent research. Open surgery and the image-guided stereotactic technique are also described in this chapter. After obtaining the tumor samples, the next step is to initiate the primary cells cultures. These in vitro techniques (either serum conditioning cell cultures and tumor stem cells cultures) will be discussed in detail in Chapters 5 and 6. Usually the new molecules with antitumor activity are tested in vitro on both primary glioblastoma cells cultures but also on glioblastoma cells lines in order to obtain a better standardized results. The next chapter, Chapter 7 is dedicated to in vivo techniques, which are required for testing the anti-tumoral effect of the new molecules before starting with the clinical trials. The author describes in detail the techniques of stereotactic intracranial inoculation of glioblastoma cells (either glioblastoma cell lines or glioblastoma-derived tumor stem cells) and the main growth patterns of the intracranial glioblastoma xenografts obtained using these techniques. Another technique very useful for exploring in real time the migratory glioblastoma cells is the organotypic brain slice cultures which is described in the last chapter of the book. This monograph is addressed to the medical students, PhD students and PhD researches who are involved in brain tumors research and perform basic in vitro and in vivo techniques like primary cell cultures initiation, cultivation of glioblastoma cell lines, stereotactic intracranial inoculation of glioblastoma cells and organotypic brain slice cultures.